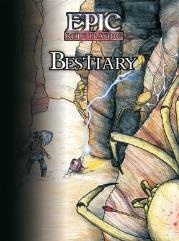 The Bestiary is a wonderful blend of living, extinct and imaginary animals, as well as troves of monsters unique to Epic RPG and its primary campaign world - Eslin. The Bestiary teems with critters that have real world behavior, ecology niches and favored tactics in combat. From the giant hydra (think high school biology, not mythology) with its long paralyzing tentacles, to the cephalobe, which skulks in darkness waiting for minds on which to feed, to the mythical Beast of Morrowdown, Guides will find all of the creatures they require for countless hours of gaming. The Bestiary also contains descriptions of common animals that inhabit wild and civilized lands. These include many animals that can be used as mounts and familiars to serve player characters. This book is one of four core rulebooks for use with the Epic Role Playing game system.